i do have two raspberry pi, One as publisher and another one as a subscriber. It works on the local area network without internet. Data transmission and receiving, works fine and data storing into MariaDB also works fine. The issue is time. The router run locally without internet connection. If someone switch off or restart router, the system depend on router time which not synchronise online time. To over this issue, i did add in RTC DC3231 in both raspberry with the following setup. # was copied by the kernel was in localtime. After i did this , its work on RTC time till someone reset or switch off the router. Upon router up, the raspberry pi picked up router time instead of RTC time. i have to do manually to switch to RTC time. How i can over this, by saying just depend on RTC time only. 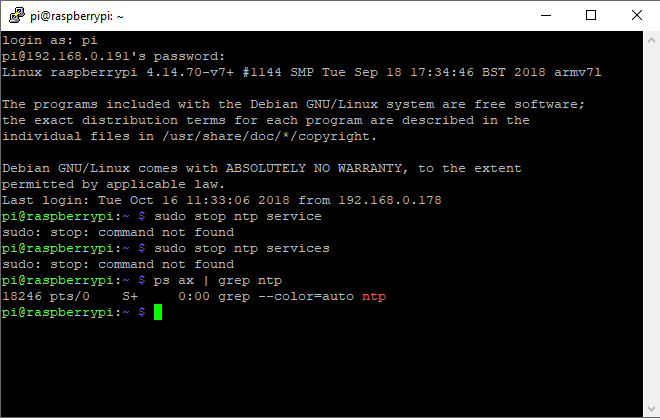 Is there an ntp service active? The please halt that. In the attach picture i do get the result after typing "ps ax |grep ntp". May i know what i am trying to acheive. ntpd is a (Network Time Protocol) daemon to get the times right, it can respond to multicast, or query specific servers. Your description seemed to indicate response to multicast. THe NTP daemon can also be used to use other time sources like GPS, DCF77, etc. etc. There might be other tools doing more or less the same job as well.